Our Cabinets are 100% wood boxes and face frames. We never use particle board. Learn more on our Cabinets page. We have the widest selection of granite, marble, and quartz in the Tampa Bay area. Learn more on our Countertops page. Preview your kitchen before it's installed using full 3D rendering. Professional design services are included with full kitchen remodel purchase. May be available on a per project basis. Please call us to discuss your specific needs. Our professional crews have the field know-how to get the job done right. Please call us to discuss your specific needs. We are fully licensed and insured general contractors, FL General Contractor CGC 1517184. At Oldja Enterprises Kitchen & Bath, we have the capability to handle any project, large or small. No matter which scopes of work we are completing for you, the first step is always the same: visit our showroom to meet us, tell us more about your project, view our cabinet selection, and choose your granite from our yard. We'll walk you through the rest! What is granite? How is granite formed? Granite is an igneous rock which is composed primarily of feldspar, quartz, and mica. It is formed when liquid magma deep within the earth's core is cooled and compressed over millions of years under tons of pressure. It is then quarried, cut, and polished. For daily cleaning, simply wipe your countertop with a soft cloth or paper towel with soapy water. Avoid using ammonia-based cleaners. Only if you want to ruin your knives! We suggest that you always use a cutting board. Does granite stain? Will I need to seal my countertop? Granite is naturally 95% stain resistant as it is not a very porous material. We seal every countertop to enhance the durability of your purchase. Still, be careful with foods and drinks that contain acids that may dull your stone's surface. Only if it is severely abused with a hammer or impact tool! A granite countertop used for normal kitchen uses will last a lifetime with minimal maintenance. 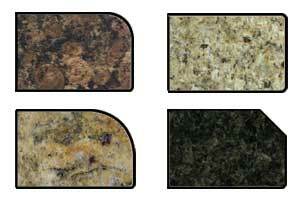 What are the four standard edges included with my granite purchase? Our price per square foot includes installation and one of the following four basic finished edges (clockwise from top-left): Quarter Round, Flat, Beveled, or Half Bull Nose. What is the difference between granite, quartz, and marble? Granite and marble are naturally formed stones. What is commonly referred to as "quartz" for countertops is actually a man-made material composed of crushed natural quartz and epoxy. I have a small project. Do you sell granite remnants? Yes, please visit our showroom to see all available remnants. I care about quality at an affordable price. How can Oldja Enterprises help me? We carry a wide range of ready-made and semi-custom cabinet door styles. All of our cabinets come standard with dovetail joints, soft-close drawers, and 100% wood boxes. Visit our showroom to speak with our designers. Details matter to me. Can I add a spice rack, wine glass holders, or lighting? Yes! We have a wide selection of hardware, molding, specialty cabinets, and accessories available. What is the difference between "stock" and "semi-custom" cabinets? With stock cabinets (also called "RTA"), what you see is what you get. You can visit our showroom to see the 150+ door style/color/wood combinations that are available. This is our most popular option, since we are able to offer the same quality at more affordable rates. A semi-custom style allows for more customization, such as color or design, but requires more time to manufacture and ship. My dream remodel requires taking down a wall. Do I need to hire a separate contractor? Not necessarily. We are fully licensed and insured general contractors (CGC 1517184), able to provide true "one stop" service to those looking to do a full kitchen remodel. We will determine the scopes of work to be completed at time of contract. All of Oldja Enterprises' cabinets come standard with soft close shock buffer that prevents drawers from being slammed shut. This buffer gently engages the door and quietly closes it. You'll notice the difference! Do you sell cabinet hardware, i.e. knobs and pulls? We carry the entire lines of both Jeffery Alexander and Elements hardware. You can view the selection and their pricing on the Hardware Resources website. Please come into the showroom to finalize your selections and make your payment.